Why has world trade been so weak in recent years? Before the crisis world trade tended to grow around twice as quickly as world GDP, but since 2012 trade growth has simply matched that of GDP. So what explains this weakness? Contrary to some other economists, this post finds no evidence that factors such as slowing growth of supply chains or the expenditure split of demand can explain the weakness relative to GDP. Instead, it is due to the changing composition of global activity: over time a greater share of world activity has been accounted for by countries whose imports grow more slowly relative to GDP. These trends are likely to continue, such that world trade is likely to grow more slowly relative to GDP than in the past. 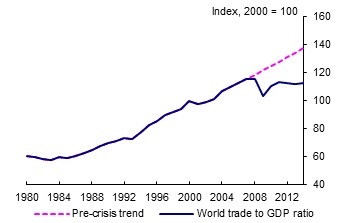 Prior to the crisis, world trade tended to grow at around twice the rate of world GDP on average, meaning that the world trade to GDP ratio trended up over time (Chart 1). But during the crisis, the decline in trade far exceeded the fall in world GDP. And over the past four years trade growth has only matched that of world GDP, such that the world trade to GDP ratio has remained flat. This has raised questions over whether the world trade to GDP ratio has peaked and if the factors driving global integration of production have run their course. 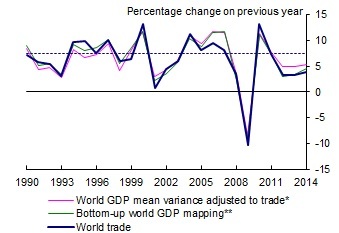 A number of economists have investigated the possible reasons for this apparent breakdown in the relationship between world trade and GDP growth. While there is a consensus that part of the decline is likely to reflect cyclical factors, structural factors are also likely to have been important. Constaniscu et al, suggest the relationship between world trade and GDP may have broken down because of slowing growth of global supply chains, and a recent ECB piece points to the expenditure split of global growth. But this post challenges these explanations. It first looks at what has driven movements in world trade up to the end of 2014 before going on to consider the implications for future trade growth. Much of the poor performance of trade reflects the weakness of world GDP growth. One simple way to illustrate this is by adjusting world GDP growth such that it has the same mean and variance as world trade growth (using pre-crisis parameters). This is useful because world trade has a much larger variance than world GDP (the standard deviation is around 3.5 times larger). That means that as global GDP growth slows, world trade growth tends to slow by even more, as its higher variance amplifies the effect of a shock. So by mean variance adjusting world GDP, it is possible to see how we might expect trade to move for a given change in GDP, if the two series were perfectly correlated. This is shown by the pink line in Chart 2. 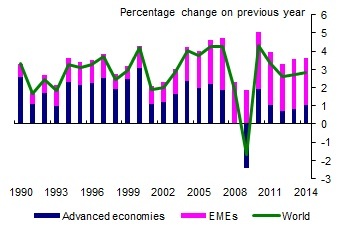 The chart shows that sluggish growth of world GDP relative to its pre-crisis average explains a good chunk of the trade weakness: the differences between the pink line and the dashed line (average trade growth) accounts for around 60% of the weakness of trade growth (the blue line) relative to its historical average. 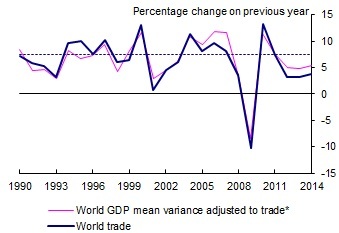 But world trade is still weaker than we would have expected based on its past relationship with world GDP. Chart 2 suggests trade growth should have been around 2pp stronger than was actually seen over the past three years based on the past relationship with GDP. The trade elasticity (i.e. the ratio of average import growth to average GDP growth) is the same across countries. Or the contribution of different regions to global activity is constant over time. Looking at the data, we can see that neither of these holds. 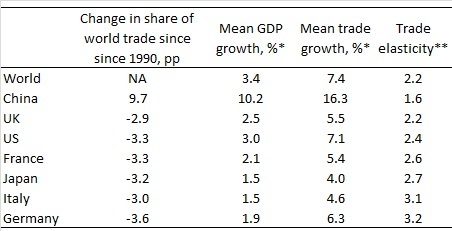 The trade elasticity varies quite significantly across countries (Table 1). In particular, imports tend to grow much more rapidly than GDP in some euro area countries such as Germany and France. Whereas in China, the trade elasticity is significantly lower than the global average. At the same time, the composition of global activity has not been stable. In particular, countries where the trade elasticity of growth is lower, such as China, now account for a higher share of global GDP, whilst some advanced economies (most notably some euro-area countries) make up a smaller share. And these changes in the composition of global activity growth have been particularly marked since the crisis, with emerging economies accounting for a significantly larger share of global growth than was the case prior to the crisis (Chart 3). Accounting for the change in the composition of global growth, we can fit the post-2012 data remarkably well. To demonstrate this, the green line in Chart 4 maps GDP to imports for more than 100 countries and then weights each country by its share in world imports, using annual data to the end of 2014. This bottom up approach shows that if we were to look at each country individually, we would not be surprised by the weakness of trade in recent years. This implies that change in the composition of growth can explain the puzzling weakness of trade recently. Given imports have, on aggregate, moved in line with GDP within countries, it is not obvious that we need to appeal to factors such as the composition of GDP or the changing nature of global supply chains in order to explain the weakening in global trade. And that is supported by the evidence discussed below. It is possible that the expenditure split of world GDP could explain the weakness of world trade growth. Components of GDP such as investment and exports are more reliant on imports than household consumption and, in particular, government consumption (see Bussière et al, 2013). So if the current weakness in global growth were concentrated in investment that would weigh on trade by more than if consumption was particularly weak. But it seems unlikely that the expenditure split of global growth has weighed on world trade recently. 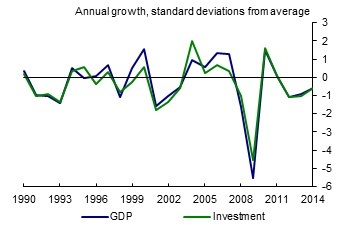 That is because global investment has not been particularly weak relative to GDP as a whole in recent years (Chart 5). Some economists (for example see Francis and Morel, 2015 and the World Bank, 2015) have suggested that the puzzling weakness of world trade relative to GDP could reflect a structural change in supply chain integration in recent years. The increasing importance of supply chains since the early 1990s is often cited as a key reasons why the world trade to GDP ratio rose rapidly since then. As production chains become more fragmented, imports of parts and components should increase as these intermediate inputs are processed and then re-exported, increasing the growth of trade relative to GDP. But in the past few years the proportion of trade accounted for by intermediate goods has fallen. And this is something that some economist outside the Bank have pointed to when arguing a slowing of vertical integration could explain the recent trade weakness (for example, see this recent ECB Economic Bulletin article). However, it’s not obvious that there has been any structural change in the integration process of global production. Whilst it is true that trade in intermediates has slowed by more than trade in final goods, that is not particularly surprising. 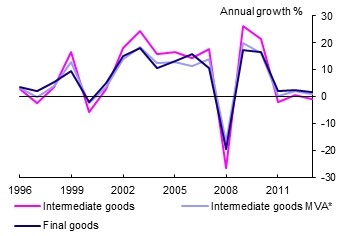 Although intermediate goods trade tends to grow more quickly than overall trade, it is also more cyclical (Chart 6). That is likely to be because the components of final demand that are most cyclical, such as capital goods or consumer durable, having longer supply chains (Ferrantino and Taglioni 2014 find evidence that goods that have longer global supply chains are more sensitive to income than those that are not). Once we account for the difference in the variance, the extent of the slowing in intermediate imports has been in line with what we would have expected given the decline in final goods trade (Lilac line in Chart 6). And so while supply chains are amplifying the cyclical weakness in trade, there doesn’t appear to have been any structural change in the importance of global supply chains that can explain the recent weakness of trade relative to GDP. Global growth is expected to remain weaker than prior to the crisis, due to weaker global potential supply growth (see the recent IMF WEO chapter for more information). Given the higher variance of trade growth relative to GDP growth, that will continue to weigh on the trade growth to GDP ratio. The weight on EMEs, which have low trade elasticities, is expected to continue rising (albeit at a slower pace than the past given the slowdown in potential growth expected over the next few years), further depressing the global trade elasticity. That will continue to weigh on world trade growth. Kate Stratford works in the Bank’s Global Spillovers and Interconnections Division. If you want to get in touch, please email us at bankunderground@bankofengland.co.uk. Previous Post Does oil drive financial market measures of inflation expectations?